The artist couple Christo and Jeanne-Claude worked together for nearly half a century, from their first outdoor wrapped work on the dockside of Cologne harbour in Germany in 1961 until the death of Jeanne-Claude in 2009. Now Christo works alone. The name Christo is still most closely associated with the wrapping of public buildings—most notably Paris’s Pont Neuf in 1985 and the Reichstag in Berlin 1995. But their projects have taken multifarious forms, including punctuating New York’s Central Park with more than 7,500 vinyl gates, simultaneously erecting thousands of umbrellas through two valleys in Japan and California and floating pink polypropylene around 11 islands in Florida’s Key Biscayne. Another equally significant, if less well known, sculptural element has been the stacked metal oil barrel, used by Christo since the late 1950s. Often monumental in size—a 1969 proposal for Houston, Texas, would have consisted of a million stacked barrels—many barrel pieces have not been realised. Now this is set to change with Christo’s first major project in the UK, consisting of a rectangular shaped “mastaba” made from stacked oil barrels floating on the Serpentine lake, which coincides with an exhibition in the Serpentine Galleries devoted to the use of oil drums in the couple’s work. 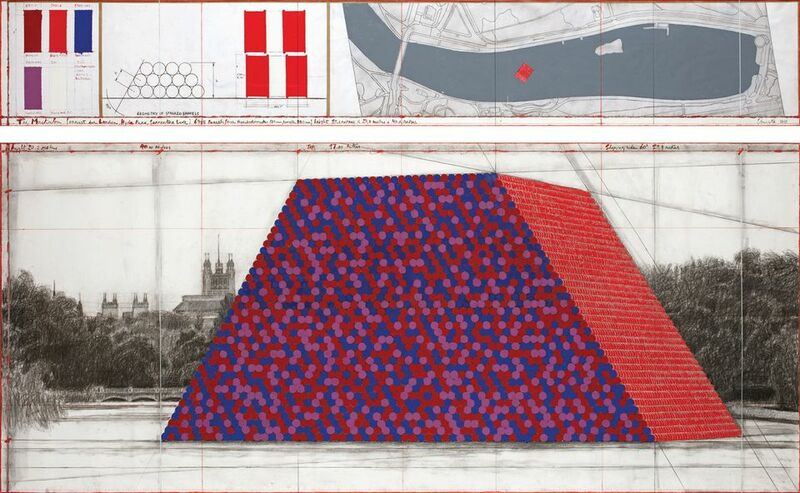 Christo: Mastaba is an old word coming from the first urban civilisation 7,000 years ago, when people moved from the countryside to mud houses in Mesopotamia, which today is Iraq. When for the first time archaeologists discovered streets and mud houses, in front of these houses was a bench, which has this form with two slanted walls, two vertical walls and a flat top. Later, that form became the tombs of the pharaohs in Egypt, and in the Gulf area they still give the same name to the benches that exist in the villages. We discovered it when we were working in the Middle East. You have made the Serpentine Mastaba from stacked oil barrels; these have been a recurring element in your work right from the beginning. Even before our first outdoor exhibition in 1961 in the harbour of Cologne I had already made barrel sculptures in the late 1950s; some wrapped, some not wrapped, some stacked together. If you stack oil cans or cylindrical objects horizontally then the angle of the slanting wall is always sixty degrees and the ends of the barrels make a vertical wall. The sculpture on the Serpentine lake will be built from 7,506 oil barrels; it is the height of a five-and-a-half or six-storey building. It is very important to be floating—the first row of barrels will be one third in the water—and it is moving because it is sensitive to the movement of the water. What is it about the barrel that appeals to you? I love the barrel as an object; it is something very common for transporting goods, starting from little cans to the big barrels. They are industrial, they can have different colours, different varieties, and are extremely simple, very magical and very difficult to explain. It is a very extraordinary sculptural form. Your long history of using barrels is explored in a concurrent exhibition at the Serpentine Galleries, which underlines the importance of the form in your work and the fact that you have been seeking a suitable site for a floating mastaba since the 1960s. It’s very focused and the barrels are rarely exhibited. I am very happy that the overview of the Serpentine Galleries will translate that part of our work, which is very little known. There are the early, very humble sculptures of the 1950s, the large sculpture barrels and museum projects which were never realised and documentation of my Iron Curtain, which blocked an entire street, the Rue Visconti, on the Left Bank in Paris in June 1962. The show is designed like a laboratory so it is more like being in the studio. There is an intimate relationship to the things: very small drawings, large drawings and scale models. It is very architectural in a way. 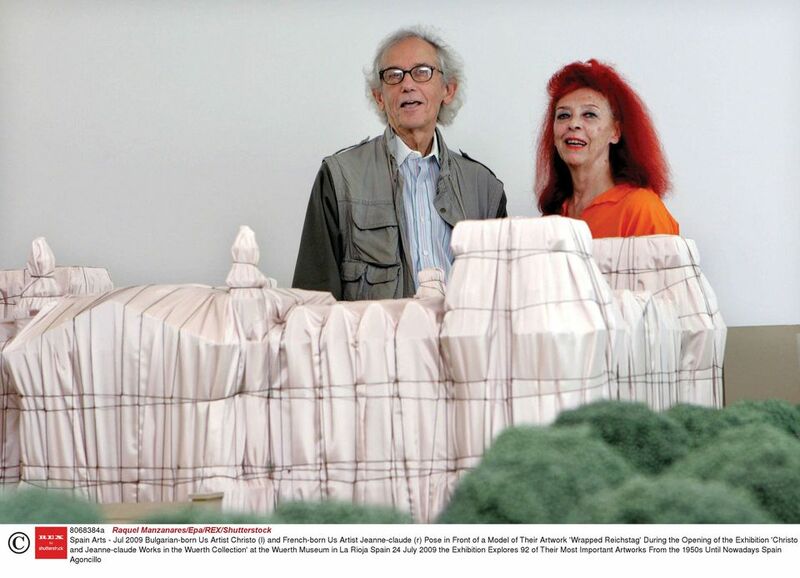 For many people the names Christo and Jeanne-Claude are synonymous with wrapped forms. What first inspired you to use this method? For thousands of years artists have used fabric and I use the case of French sculptor Rodin as an example of what fabric can do. Rodin had the commission to do the monument to Balzac, the French writer. In the first version Balzac was totally naked with a big belly, skinny legs and many details. What Rodin did was take the cape of Balzac, put it in liquid plaster and shroud the figure we have today. With our wrapping project we did exactly that: if you know the Reichstag, the typical Victorian building is covered with sculptures, ornament and decoration. For 14 days all that was covered with fabric to highlight the principal proportion of architecture; all the detail disappeared. But, like classical sculpture, all our wrapped projects are not solid buildings; they are moving with the wind, they are breathing. The fabric is very sensual and inviting; it’s like a skin. How do you choose the environments for your work? What are your criteria? All our work is done where people live. The work is in urban space and rural space: urban space like the Reichstag Project in Berlin, or the Central Park Gate, or rural like the running fence in Northern California or the Umbrellas in Japan and California. In the rural space we always need to have a manmade structure—a telephone pole, a road, a bridge, a house—so you can have relation to the scale because in the wilderness you have no relation to how the thing is—how wide, how long, how big, etcetera. How do I select? All my life is about hundreds of circumstances: for some projects you design for particular sites like the Reichstag or Central Park, and for some projects you have the concept and you need to find the site. You never take commissions and you always pay for everything yourself. Why? Because I like to be absolutely free, to be totally irrational with no justification for what I like to do. I will not give up one centimetre of my freedom for anything. Inadvertently, and in some ways fortunately, I studied Marxism in Bulgaria and coming to the West I used the capitalist system to do my project. I created a corporation to build our projects, to sell our original works of art and to buy back our original works of art. Jeanne-Claude passed away in 2009. It must be hard to be working without her. Jeanne-Claude and myself were born on the same day, the same year, the same moment, on 13 June 1935. We met in 1958 when we were both 23. She was extremely argumentative, very critical and I miss that so much. She was always asking questions and I continuously miss her. I always think when things become very difficult, what would Jeanne-Claude think now? I continue to work on many projects simultaneously; I must work on many projects because I am sure to get permission. Now I am fully, fully engaged in the Mastaba project for Abu Dhabi, which will be the biggest sculpture in the world—bigger than the Pyramid of Cheops [Giza]. But I have another idea which I cannot tell you: unlike many artists I will never accept to do any retrospective. I never like to look back and this is why I have ideas for other projects, other things. 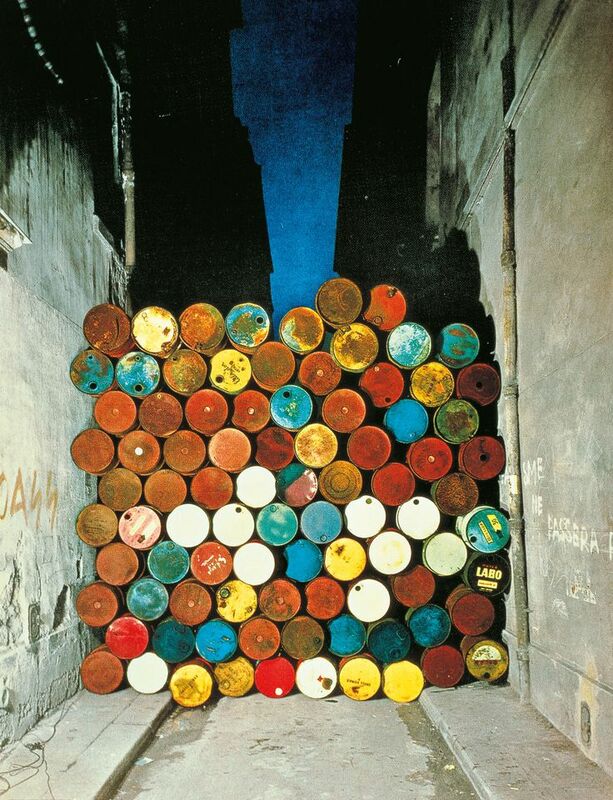 On 27 June 1962 Christo and Jeanne-Claude barricaded a narrow street on Paris’s Left Bank, the Rue Visconti, with a wall of 89 used oil barrels. Their first large-scale public piece, it was made in protest against the Berlin Wall, which had been built the year before. The work was also set against a backdrop of Algerian war protests. 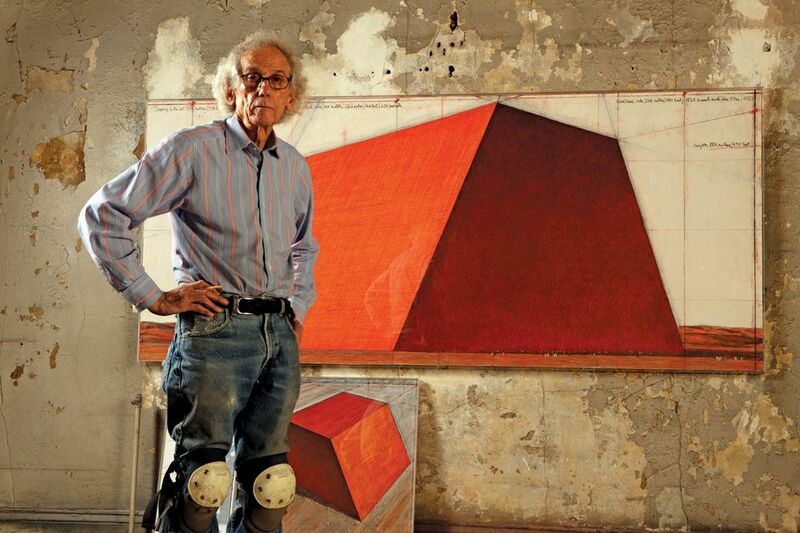 Christo considers it to be one of his most important early works. “Coming from a communistic country as a political refugee I was eager to do my own iron curtain which blocked an entire street,” he says. According to the artists, the piece could also exist in future incarnations: either transforming a street into a dead end or “extended to a whole area or an entire city”. The work was in situ for eight hours before the authorities ordered it to be dismantled. It took nearly 25 years to realise this project, but for two weeks from 23 June 1995, the Reichstag was shrouded in 70 tailor-made panels of silvery polypropylene fabric, held in place and shaped by blue ropes. This wrapping was installed not using scaffolding but by a workforce of 90 professional climbers. As Christo and Jeanne-Claude, pictured with a model of the work, described it, “the richness of the silvery fabric, shaped by the blue ropes, created a sumptuous flow of vertical folds highlighting the features and proportions of the imposing structure, revealing the essence of the Reichstag”. Between 9 and 27 October 1991 3,100 umbrellas were simultaneously opened in two inland valleys: one north of Tokyo and one north of Los Angeles. According to Christo and Jeanne-Claude, the project “reflected the similarities and differences in the ways of life and the use of the land”. 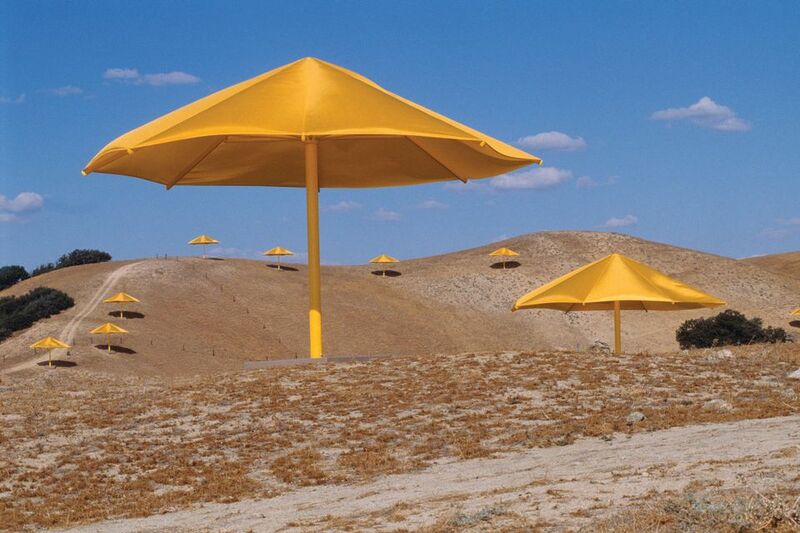 In Japan’s “luxuriant vegetation enriched by water all year round” the umbrellas were blue and positioned close together; in the dry landscape of California they were yellow, with their configuration “whimsical and spreading in every direction”. The artists stated that these “free standing dynamic modules reflected the availability of the land in each valley, creating an invitational inner space, as houses without walls or temporary settlements”. The $26m project was financed solely by the artists. Background Christo Vladimirov Javacheff was born on 13 June 1935 in Gabrovo, Bulgaria, into an Bulgarian industrialist family; Jeanne-Claude was born on the same day in Casablanca, to a French military family. She died on 18 November 2009 in New York. Education: Christo studied at the National Academy of Art in Sofia, Bulgaria, between 1953 and 1956; Jeanne-Claude studied Latin and philosophy at the University of Tunis in 1952. Milestones: In 1956 Christo left Bulgaria and two years later arrived in Paris where he met Jeanne-Claude. In 1960 their son Cyril was born and in 1961 they made their first artistic collaboration, Stacked Oil Barrels and Dockside Packages, in Cologne harbour. In 1962 they attracted notoriety with their Wall of Oil Barrels—The Iron Curtain in Rue Visconti, Paris. The artists moved to New York in 1964. Temporary projects realised during 1968 include Wrapped Kunsthalle Bern, Switzerland; Wrapped Coast, One Million Square Feet, Little Bay, Sydney, Australia; 5,600 Cubicmeter Package, Documenta IV, Kassel; and 1,240 Oil Barrels Mastaba, installed in the ICA Philadelphia. Subsequent projects include Running Fence in 1974, in California, and the wrapping of the Pont Neuf, Paris, in 1985 and Reichstag, Berlin, in 1995. In 2005 The Gates put more than 7,000 gates of nylon fabric along the walkways of New York’s Central Park. Christo abandoned Over the River, a long-running project for the Arkansas River, following five years of legal arguments and local opposition and the election of Donald Trump in 2016. (The land is owned by the federal government of Washington, DC with the president as landlord.) The first project to be completed following the death of Jeanne-Claude was The Floating Piers, which, for 16 days in 2016, ran across the surface of Lake Iseo in Northern Italy.